Whether it be Champagne from France, Cava from Spain, a sparkling wine from the U.S., or Prosecco from Italy, pairing decadent cheese with elegant bubbly is one of life's pleasures. You don't need to save a good wine-and-cheese pairing for New Year's Eve or another special occasion—it's ideal for a regular Friday night, simply to celebrate the end of the workweek. A good sommelier or wine shop owner can often help point you in the right direction when it comes to picking a cheese to serve with wine, as can a cheesemonger. These five kinds of cheese pair especially well with sparkling wines from all regions. Luxurious cheese meets luxurious wine. Triple Crème (or double cream) cheeses are rich and buttery with a whipped texture and fairly mild flavor, similar to brie cheese. The high butterfat content in triple crème cheeses that coats your mouth in creamy goodness is balanced out by the refreshing bubbles in sparkling wine. Look for Triple Crème cheeses like Mt. Tam, Brillat-Savarin, Saint Andre, and Pierre-Robert, or a double cream like Cremont. Triple crème pairs best with Prosecco, particularly dry versions, as well as French cremants, such as rose Cremant d'Alsace.The acidity in dry wines cuts through the creaminess of triple crème cheeses. Camembert has a seductive but not overpowering—unless it's super ripe—flavor. The woodsy, mushroomy flavor of Camembert pairs nicely with the yeasty and fruity flavors in sparkling wine, particularly Champagne. Similar cheeses that are not technically Camembert but share some of its qualities also pair well with sparkling wine. Look for Pave d'auge or Roucoulons. Gruyere is a hearty mountain cheese with a dense texture and rich flavor. The light touch of sparkling wine elevates the cheese into something more elegant, highlighting its sweet, nutty qualities. It pairs best with traditional French Champagne. 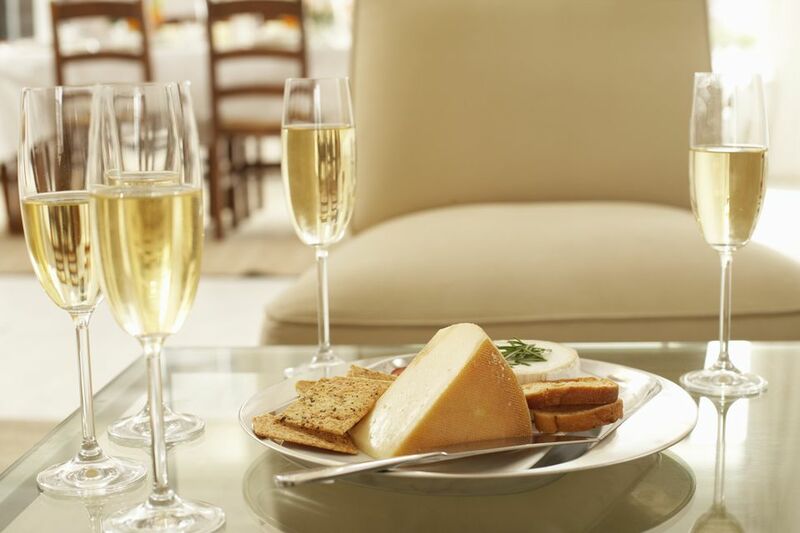 Serve Gruyere as part of a cheese plate paired with sparkling wine or drink sparkling wine with fondue made with gruyere, bite-sized grilled cheese sandwiches, or a Gruyere Quiche for a Champagne breakfast. Similar cheeses include Comte, Appenzeller, or Challerhocker. Baby Swiss cheese, which is a bit more buttery and nuttier than aged Swiss, also pairs well with a variety of sparkling wines, including Champagne and Prosecco. Parmigiano Reggiano cheese is more acidic than creamy and more dense than airy. It comes from the same region at Lambrusco, a red sparkling wine, and the two just seem to work together. Parmigiano Reggiano is different than standard Parmesan, which isn't made in the European Union, so make sure you're picking out the right kind. If you want something that's a little more exotic than standard Parmigiano Reggiano, look for Podda Classico, a mixed-milk cheese from Sardinia. Epoisses—pronounced eh-PWAHS—is notoriously stinky and full-flavored, making it a tricky pairing with sparkling wine. In a successful pairing, the crisp bubbles in sparkling wine, especially in a full-bodied Champagne—since Epoisses also hails from France—or fruity sparkling rose that's heavy on the pinot noir, can balance out the salty, meaty flavor of a washed rind cheese. If Epoisses isn't available, ask at your local cheese shop for something similar, like Colorouge or Pont l'Eveque.